People - Thai, Muslim & Sea Gypsy - Ko Lanta (Island), Krabi, Thailand. Ko Lanta is home to three very distinct cultural groups – the Chao Ley (Sea Gypsies), Thai-Muslim people and the Thai-Chinese. All share innate Thai warmth that’s locally known as ‘The Ko Lanta Charm’. They’ve lived together in peace and harmony for hundreds of years in mixed communities around the island. Today most tourists find it difficult telling the distinct groups apart. The Chao Ley preceded Malay migrants who had been converted to Islam from ancient animistic beliefs, adapting the new religion into their traditional culture. 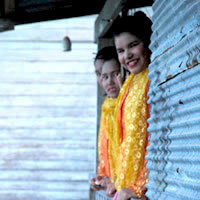 These settlers, many of whom came from Sai Buri and Nakorn Sri Thammarat, referred to themselves as ‘Orang Lon-Ta’. Orang is a Malay term meaning ‘people’, and on old Malay maps the island is named ‘Pulau Lonta’. Today the local Thai Muslims on the island practice a moderate version of Islam. Chinese merchants arrived on the island more than 100 years ago during the revolution that saw communist ruler Chairman Mao Tse Tung take power. They fled to trading ports throughout Southeast Asia (including Ko Lanta) from Kwang Tung, Hai Lham Island and Sua Thaw in China. Today they continue on the island as business owners, agricultural farmers and fishermen. The nomadic Sea Gypsies (Chao Ley) arrived on Ko Lanta more than 500 years ago with their unique language, matriarchal social system and animist beliefs. Today they are struggling to pre serve their traditional culture in the face of growing tourism and the influence of western culture. 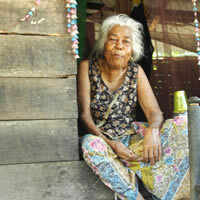 Sea Gypsies came to the area as nomadic boat people of Indo-Malay origin with a subsistence-based fishing livelihood. Today many have been granted land, surn ames, and citizenship in Thailand. These unique people blend into the local population but they retain their own language, culture and close ties with the sea. The Chao Ley shown here are from a tribe called Urak Lawoi, who according to local legend are relatives of Morgan, another group of Sea Gypsies on Surin Island in Phang Nga. Both groups migrated along the coa st of Saiburi , now Malaysia 's Kedah state, around Gunung Jerai Mountain . They later separated and established separate settlements on various islands in the Andaman Sea. There are still two Chao Ley villages less than a kilometre apart on the southeast coast of the island. There is one tiny, private Sea Gypsy museum called ‘Sea Gypsy House’ nearby, a seaside compound with various buildings standing amongst the mangroves and tidal pools near Ko Lanta’s Old Town. It serves as both an educational centre for visitors and a place for the Sea Gypsies to fashion jewelry and traditional musical instruments. Having originally been the trade centre for this area, it’s not surprising that Ko Lanta’s first settlers absorbed a mixture of various cultural traditions, resulting in the melting pot of today. One product of this is the performance of original Rong Ngeng dance and music. The folk dance incorporates movements from old-fashioned western dances, while the music is played on the violins, Arabian drums and Chinese gongs. It also includes the use of Ramana ( Raman Drums) and Malaysian lyrics. Rong-Ngeng is customarily performed by the Sea Gypsies during special festivals, including the aforementioned “Loy Rua” (Floating Boat). A full-length performance is included annually at the Laanta-Lanta Festival. Due to its popularity with tourists, many resorts are also hire troupes to perform Rong-Ngeng for special occasions.